Station in Manly. This time it’s a well dressed European woman – is there a connection? history through to the final solutions for the murders. All is definitely not what it seems. This novel set in Sydney’s northern beaches is guaranteed to keep you guessing, while at the same time revealing much of beachside Manly’s history. This is an ambitious novel from an experienced Australian female writer, but her first fiction title. It is a police procedural with a penetrating sense of place, partly because of the author’s strategy of giving descriptive background whenever the main characters visit a new location. The setting is reinforced by an authenticity of language that particularly shows in the construction of dialogue. She also has a strong sense of just how tedious and meticulous detective work can be, but at the same time how the solution can be found quite accidentally. Apart from the main plot of the two murders there are a couple of strong sub-plots centred around the detective inspectors investigating the murders. I liked the two main detectives, both of whom I found very plausible. Georgia Show in particular reminded me of Helene Tursten’s Detective Inspector Irene Huss. The author successfully brings all plots together by the end of the novel, but didn’t quite seem to know when to stop writing. The final chapter gives us an update on each of the main characters in the book which I didn’t really think we needed. The blurb on the novel calls it Australia’s answer to Midsomer Murders, but I don’t think it is quite that yet. 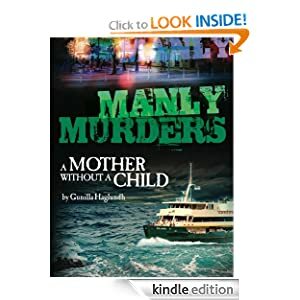 Certainly Gunilla Haglundh has a fertile imagination, has created some strong investigative characters who presumably we will see in future novels, and so with her help there is every possibility Manly will become Australia’s Midsomer. Definitely an author to follow, although the book could do with judicious editing. The second book in the series, A LIFE SAVER’S SECRET, will be launched in May 2013.